Recently I was asked two questions that I think resonates with a lot of people, and so, I want to share it with you guys- my amazing wordpress readers and subscribers. It’s on forgiveness. I hope it’s a blessing. Please feel free to ask any questions you might have. 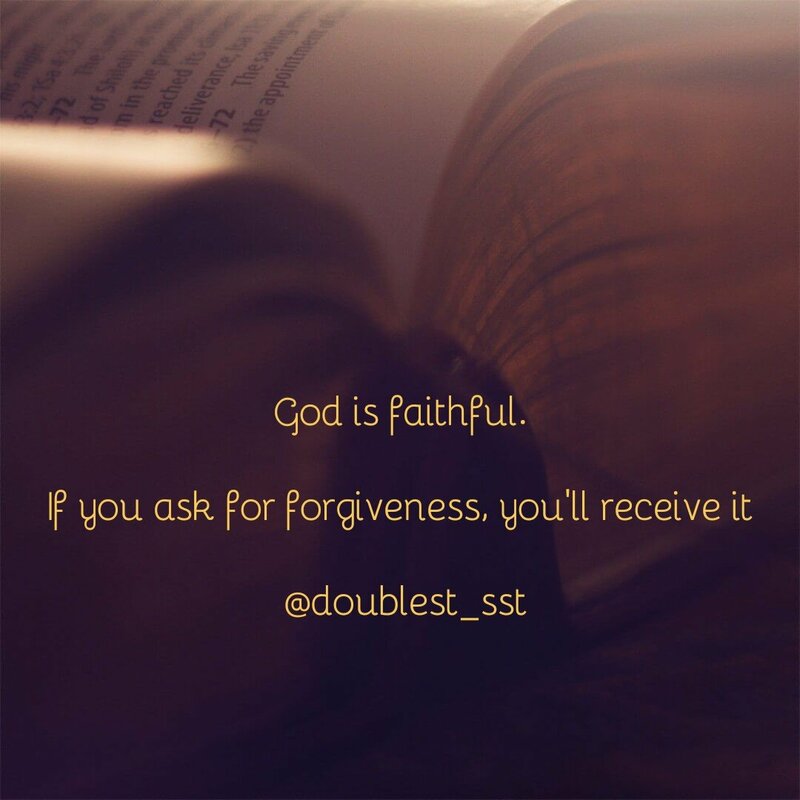 Does God forgive a consistent sinner that constantly ask for forgiveness? This is a deep question. I often fall guilty myself, so I can understand the frustration that comes with it. I am excited by the honesty in this question because it shows someone who is finally ready to receive help. Help that has been freely given to us all. In answering this, the number one and most important thing to note is that God is faithful. Faithful not because of who or what we do, but because of who He is. However, the Bible says in Romans 6:1, “shall we continue in sin, that grace may abound?” Certainly Not. Truth is, in the context of the question above, It is easier said than done. Repeating the same thing over time becomes a habit and habits are not easily broken. Can God forgive? I think this is a wrong question. God does not forgive, God has Forgiven already always and forever. This He did on the cross. Hebrews 9:22 And almost all things are by the law purged with blood; and without shedding of blood is no remission (kjv). As Christians, or in becoming Christians, we walk into this forgiveness. When we pray for forgiveness, we ask to walk into that which God has already done. The reason why God does not want us to sin is because of what that does to us… The guilt, the shame, the lack of peace, the hurt… God does not like seeing his children broken, unsettled and unhappy. What can a Christian do to help such a person? To help such a person, you have to be truthful, loving and realistic in your approach. Romans 5:8 But God commendeth his love toward us, in that, while we were yet sinners, Christ died for us (kjv). Romans 5:9-10 Much more then, being now justified by his blood, we shall be saved from wrath through him. For if, when we were enemies, we were reconciled to God by the death of his Son, much more, being reconciled, we shall be saved by his life (kjv). Bad (and good) habits are built up with consistency and these bad habits must be broken down with consistency. I do not know the specifics of the sin we are all guilty of, but if we are to stop it, it’s not an on and off situation. It has to be consistent, intentional and genuine. Then replaced with something else that is positive. It is not enough to stop doing evil, you must start doing good. Let the person accept truthfully that what he or she is doing is wrong and genuinely confess to God. Not because of guilt but because he or she loves God. Ask God to come into his or her life or rededicate his or her life. Find an accountability partner, someone he or she respects, someone that will not judge them, someone that is willing to listen to them patiently and can get achievable targets and punishments to keep them in check. The person might need to change friends, or whatever the trigger is. Trigger is what causes you to sin, it could be your phone, movies, what you hear, where you stay, Etc. For example, if as a youth leader, I am sexually attracted to one of my fellowship members (female), I should never visit her without another female around, or better yet, I should alway send a female representative any time there’s an information for her. Saying nothing will happen is the reason why a lot of things are happening currently.We must find our triggers and destroy them as we allow God to gradually renew our minds. Pray, Read God’s word, Surround yourself with positive and like-minded people. These were my recommendations to the person that asked for her friend. Please feel free to add your contributions. God bless us all as we learn to forgive and receive forgiveness. Amen. Oluwatosin Olabode aka Double ST.